Although the job market is improving, it's still not strong enough to fully satisfy Federal Reserve Chair Janet Yellen. Wages are rising too slowly, and too few Americans are participating in the job market, she told senators on Tuesday. "Although the economy continues to improve, the recovery is not yet complete," Yellen said in testimony before the Senate Banking, Housing and Urban Affairs Committee. "We judge that a high degree of monetary policy accommodation remains appropriate," she added later. The Federal Reserve has been trying to stimulate the U.S. economy since 2008 by keeping its key short-term interest rate near zero and by buying bonds to reduce longer-term interest rates. Low interest rates are intended to boost borrowing and spending by businesses, consumers and homebuyers, thereby revving up economic growth. Critics argue that the Fed could pump too much easy money into the economy, triggering a bubble or broader inflation. Yellen noted in her remarks that prices of real estate, stocks and corporate bonds have risen but remain "generally in line with historical norms." But the Fed's report on monetary policy, also released Tuesday morning, rattled investors. "In aggregate, investors are not excessively optimistic regarding equities. Nevertheless, valuation metrics in some sectors do appear substantially stretched -- particularly those for smaller firms in the social media and biotechnology industries," the report said. The Nasdaq lost all of it gains following the report, with social media stocks and biotechs getting hit particularly hard. The Dow Jones industrial average and the S&P 500 also fell. The Dow had hit an all-time high earlier. The Fed has gradually started reducing its bond purchases this year, but it has kept its foot on the gas pedal when it comes to a low short-term rate. Investors largely expect the bond purchases to end in October, and are now obsessed with a guessing game about when the Fed's first rate hike will occur. Most Fed officials expect an increase sometime in 2015, but Yellen noted that if the labor market improves more quickly than expected, rate hikes could "occur sooner and be more rapid than currently envisioned." Yellen also noted that although the economy slowed in the first three months of the year, Fed officials expect it to grow at a "moderate pace over the next several years. Data released last month show the economy contracted at a 2.9% annual rate in January through March, marking the weakest quarter for the economy since the Great Recession. Yellen blames the decline mostly on "transitory factors," and noted that other data show the job market and consumer prices are gradually nearing the central bank's goals. As of June, 6.1% of American workers were unemployed. That's the lowest unemployment rate since 2008. That said, Yellen also noted that she would like to see wages rise more rapidly and fewer Americans grappling with long-term unemployment. She discussed the "exceptional psychological trauma" facing workers who are still unemployed. "For people, their jobs are often their identities," she said. 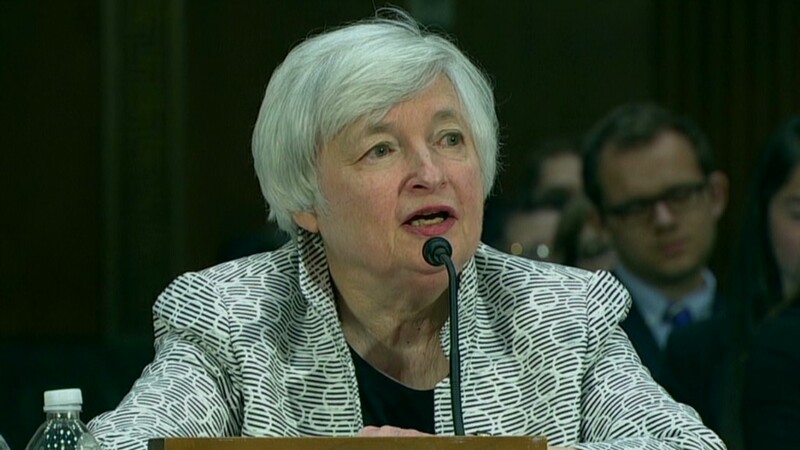 Yellen also described the recent slowdown in the housing market as "disappointing." For these reasons, she's only cautiously optimistic about the economy. "The Federal Reserve does need to be quite cautious with respect to monetary policy," she said. "We have in the past seen sort of false dawns, periods in which we thought our growth would speed, pick up and the labor market would improve more quickly and later events have proven those hopes to be -- to be unfortunately overoptimistic." The head of the Federal Reserve is required to formally report to Congress twice a year. After testifying before senators on Tuesday, Yellen is scheduled to deliver identical remarks to the House Committee on Financial Services on Wednesday.